NOTE: This article is outdated (as of June 2008) and slated for removal. Pepper Computing has appearently stopped operations, and as of the last I heard, was looking for a buyer. My PepperPad 3 has experienced multiple failures (in addition to the problems mentioned here) and is now unusable. It has been replaced with a Wibrain B1LE, which is reviewed here. Although I may refer to it as the P-Pad for short, the Pepper Pad its not something you use to house train that new puppy. 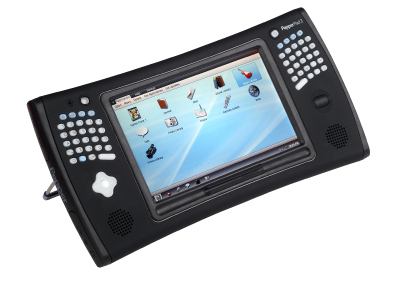 The Pepper Pad 3 is a portable Web Surfing and Media Player Device by Pepper Computer. Larger and heavier than most media players, but smaller than a laptop, it's closest cousin is the UMPC (Ultra Mobile PC). In a way, the Pepper Pad is a set of opposites: While not marketed as a laptop, the P-Pad is basically laptop hardware in a different form factor. Similarly, it appears to run a limited set of included functions, but really hides a (nearly) full Linux distribution. With a little coaxing, the P-Pad can run Linux apps. No, I am not talking about re-compiling or porting. I am talking about full, unmodified, existing binary Linux apps. Since this is in contrast to other devices such as the Sharp Zaurus, Archos Linux Media Players, the Nokia Internet Tablets, etc., I want to belabor this just a bit. If you go googling around looking for 3rd party Pepper Pad apps, your not going to find many. If I go Googling for apps that are solely written for a specific model PC, I am similarly likely to come up with very little. That does not mean that there are not thousands of apps that will work on that PC. I also want to make it clear that installing native Linux apps on a Pepper Pad is not supported by Pepper. Oh, did I mention that it sells for about half the price of a Windows UMPC? Most other reviews seem not to cover all the aspects of this device. If you have a home network, connected media players, and networked storage, you are probably interested in exploring more of what this device has to offer. This review will do that. If your Home Media System consists of a 20" picture tube TV and a $39.00 DVD player then this device, and thus this review, is probably more medicine than you will want to take. The P-Pad comes in a very nice box with a convenient handle. Opening the box gives one an impression of a very professional company. I feel that, as with other products that I have reviewed, some packaging material could have been saved by making the box a bit closer to the size of the 'Pad. The large box is likely an attempt make the P-Pad initially appear smaller. Minimizing this initial size shock is warranted as we will see. Also in the box is the AC adapter, 2 stylus's, a USB mini to USB adapter cable, a nice slip on cover, and a video out cable. As with almost everything today, the only documentation is a getting started guide. The guide, however is very nice, and actually is written in readable English. The AC adapter looks to be from a 1990's laptop. If you have seen some of the clever ideas Apple (and others) have come up with over the years -- folding prongs, cord storage, magnetic plugs, etc., you will see that Pepper's unique idea was to copy none of them. The Pepper Pad's Internet Radio Player even has pre-set 80's music stations to give that full retro experience while you do the old fashioned wrap-cords-around-hand thing. The Pepper Pad is much larger than a PDA. When I have shown my Pad to people, several of them have held their Blackberries or iPaq's near it and laughed. Only one person initially compared it to a laptop. Other than the size, the 2 most obvious features of the Pepper Pad 3 are the large widescreen display and the split keyboard to either side if it. These features make for a device that is well over twice as wide as it is tall. Other features are the integrated Directional Pad, and large scroll wheel. The entire unit is housed in a rubberized plastic case. The ends are large rubber "boots" with thick rubber doors hiding the various ports. There is also a rubber bezel around the screen. These features, along with the shape of the device give it a very industrial, almost "aqua lung" look -- exactly the opposite of the thin, elegant look of the iPod Nano or iPhone. The unit is a bit heavy, but the shape and rubber coating help make it easier to hold. The industrial look is supposedly functional for both moisture and shock. Overall, I like the form factor a lot. The screen size (7 in.) and resolution (800x600) are great, although the brightness and clearness are not. Especially in light (pun partially intended) of the screens on the PSP, new Nokia Tablets, and the iPhone, the Pepper Pad's screen, while 100% usable, is not going to impress. The story is similar for the split keyboard. It's a great idea, and quite usable, but the hard "clicky" keys could be better quality. It is my understanding that some of the newer Pepper Pads are shipping with softer keys. If true, its probably a great improvement. Don't expect full typing speed, but once you spend some time on it, text entry on this device is much better than on a Nokia Tablet, iPhone or even devices like Blackberries. In fact, most of what your are reading was typed on the Pepper Pad's built-in keyboard. There is no on-screen keyboard or handwriting recognition included with Pepper's software. Below the left side of the keyboard is the D-Pad, including a center button. The center button is separate from the 4 directional keys. This small detail is important, as it makes it much easier to hit without accidentally hitting the directional keys. I find it notable that a small company like Pepper (or is it Hanbit?) can get this right, but even Nokia seems to have produced several models with problematic pads. The scroll wheel, located on the opposite side, is equally well done by small Pepper/Hanbit, and stupidly omitted by much more established companies. It still has a feel of less than premium quality, but is very functional. As an aside, the layout lends itself well to gaming. There are no game buttons on the right side, and the scroll wheel cannot be pressed as on some mice. The right half of the space bar, however, as well as other keys such as Enter/Return function as the main buttons on most games, or can be set to do so, and are well located for this purpose. Again the Pepper Pad scores a hit where the Nokia devices, for example, miss. The use of LED's is yet another thing the P-Pad does well, in my opinion. The key pads, and the D-Pad are illuminated during use. The lighting is very even, and they are that whiter than white color that only LED's produce. Again, it causes me to wonder why the "big boys" seem to still produce phones and other devices with unevenly lit keypads. A lack of other LED's is a feature too. If you have ever seem a Dell XPS laptop you know what I an talking about. LED's consume power, and unnecessary ones for hard drive activity, LAN, Bluetooth, etc. are smartly omitted from the Pepper Pad. The one LED that is continuously on is the power button. During sleep, it lights periodically. It would be really cool if this light "breathed" like on Apple Macs. I believe Apple has this patented, and I understand that the adage "It's easier to apologize than ask permission" is not a sound business policy. A single multi-color LED on the side near the power connector indicates charging status, but consumes no power during battery operation. Opposite the power button/light is the VGA camera. There is an attempt at cosmetic symmetry between the power button, and the camera. This works cosmetically, and also provides some protection for the camera. In the upper left, behind as I mentioned, a rubber cover, are 2 USB ports, one full size, and one mini. They are both USB host ports, and an adapter is included that adapts the mini port into another normal USB connection. I am left wondering what the point is. If one of the ports allowed the P-Pad to be used as a portable hard drive, that would be great, but from what I see, that is not possible. Failing this, I would rather just have 2 normal ports. Moving to the lower left cover, we have the A/V cable connections. Top to bottom, they are Composite Video/Stereo Audio, Mic In, and a standard 3.5mm headphone jack. Notably absent is a VGA connector, or anything better than composite video. This effectively removes the Pepper Pad from the list of portable presentation devices. The video connector is a multi ring 3.5mm jack as seen on many portable devices, but it is wired a little strangely. Cables from other devices that look identical will not work. The Mic and headphone connectors are standard. The lower right houses the power connector, aforementioned charging status LED, and a reset button. There are no connectors on the upper right. Another significant omission is a standard laptop security slot. A few other features worth noting are the built-in mic next to the camera, and the stereo speakers near the bottom. You shouldn't expect booming bass from tiny built-in speakers, and you won't get it, but the stereo effect is very good. The Pepper Pad can easily fill a hotel room with your favorite music files or streaming stations. If you want to listen to music as you type, you will notice that your hands block the speakers, but even mentioning this shows I am way too picky. Below the screen, and molded into the rubber bezel is a pen holder. It sticks up quite a bit, and the thought of taking an X-acto knife to it has crossed my mind. The included stylus is likely the worst feature of the whole system. Poorly molded out of the cheapest plastic, it is almost an insult to the purchaser. Some one who just dropped US$700.00 could reasonably expect a nice machined aluminum stylus. As you might expect, the owner of linuxslate.com has a few stylus's laying about, so grabbing a better one was not a problem. Flipping the device over reveals 2 more items of interest. There is a fold out stand in a recessed grove. It solidly pops into the open position, and is strong enough so that even typing on the keypad will not push the device over. It similarly snaps shut, and then further locks in the closed position. Basically, it is what I was trying to emulate when I designed the keyboard dock for my Nokia 770. The other notable item is a large battery door. The Pepper Pad does not use a separate battery pack like most phones or laptops. This is both an advantage and disadvantage. You cannot just buy an extra pack to carry with you for those long flights, at least not in a "supported" manner. If you do not mind voiding your warranty however, it should be possible to make a new or additional battery. This frees you from reliance on Pepper/Hanbit as a supplier. If you are the type that takes sharp instruments to laptop battery packs in order to replace defective cells, you will appreciate the fact that you will have less opportunity to impale yourself on this one. With the outside well described, we can move inside. The Pepper Pad is based on an AMD Geode processor and chipset, with 256M of RAM in a standard SODIMM socket. It's clocked at a modest 533 MHz. Also included is a 20 MB Hitachi 1.8" HD, and an Atheros based 802.11b/g mini PCI card. There's a Bluetooth radio in there some place too. The aforementioned camera hangs of an internal PC I/O. It's VGA resolution is adequate for conferencing, but not much more. It is also zoomed in just a bit to much, so those you do conference with may get tired of seeing your nostrils. While the Pepper Pad does not currently come with any Video conferencing software, Skype is planned. In the mean time, the camera appears to Linux as a standard V4L2 (Video for Linux) device. Once you take the Red Pill (see below), something like Ekiga should work. These specs, like the AC adapter, seem a bit "1990's". Thanks to a well optimized OS, and the fact that the entire Keeper is really one app., performance is actually pretty good. Another interesting bit of hardware is a compete set of IR emitters and receivers -- both IRDA and consumer IR. This, allong with an included app, allows the P-Pad to be used as a learning remote control. The P-Pad has some hardware hacking potential, too. RAM can be upgraded to 512M or 1Gig, and as long as you find an drive with the proper connector and dimensions, it too is upgradeable/replaceable. Replacing it with a Flash based device would be a great project, and prices are moving into a range to support this. Overclocking really does not seem to be needed, and in fact, some people have down clocked their 'Pads for battery life and thermal issues. This is easily done from the BIOS. Thermal issues? Yes, there do seem to be some thermal issues. The device is totally enclosed in plastic, with no vents, so there is little opportunity for thermal control. Apparently it is the cold cathode screen backlight that gives off most of the heat, not the CPU. There is also something that gets very hot on the left side if you are using the unit and charging it at the same time. So far, I have not had any problems, but some users report crashes, or touch screen issues that they believe are thermally related. Notably lacking from the Pepper Pad is any removable storage -- no optical drive, and no card reader. The missing card reader is a big disadvantage. I intend to investigate grafting a USB SD card reader in someplace. My unit also had a more serious hardware issue. The full story has been moved to the Forums. The short story is that it actually had a chip soldered in the wrong way! Battery life is on par with Laptops, and most similar devices. Expect about 2 - 3 hours of continuous WiFi use or Movie playing, but trying both at the same time will drop you under 2 hours. I have not tried an extended WiFi off run -- It kinda defeats the purpose, but reports indicate that music playing only, for example, battery life is much longer. With some attention paid to battery conservation, my Pepper Pad will just barely make it through an 8 hour workday of note taking, surfing, emailing, etc, interspersed with letting it sleep. Pepper's real product is the Pepper Software, not hardware. Basically, the current Pepper Software is a Fedora Core 4 based Linux distribution. Unlike other Disto's however, this distro is "Peppered" with proprietary, closed source software. You open source fanatics may need to run off and hug your copy of the GPL, but yes, you can add proprietary code to Linux, and Pepper has done so on several different layers. Pepper has basically done 3 things: Modify GPL'ed drivers for the Pepper Pad hardware; Written closed source drivers for other Pepper Pad hardware; and written a closed source user interface and suite of user applications. This last part is referred to as the Pepper Keeper, and is what I will describe in this section. The Pepper Home Screen is clean, simple, and optimized for small screens. There are no menus, instead, a tab motif is used. The desktop has tabs for Applications, Help, and Settings. Applications open full screen, and have their own tabs that replace the Desktop tabs. Most apps have another set of tabs or a menu bar below the top row of tabs. Below the app display area is a thin text notification bar, and then another area that is separated left and right. The left side is basically an app switcher, with icons for each open app -- again presented as tabs. The right side is a notification area, where there are icons for various things such as network status, time, battery level, etc. Overall, I give it high marks for UI design. I really don't like tabs, but Pepper makes them work well on the limited screen. I like the message area. Having a dedicated area for written notifications is something other OS's lack. Almost all of the areas are shared by all apps. If you are playing a local music file, or streaming audio from the network, yet another thin bar appears at the very top of the screen. It remains there even when you switch to other apps. It has the usual media control buttons, a scrolling Title area, and volume and position-in-file (if applicable) sliders. This sharing of screen areas, generally works well, especially on the limited screen area of a hand held device. It does however display some "quirks", that in some cases show that further development is needed. For example, the browser has a maximize function that makes the tab and notification areas at both the top and bottom of the screen go away, leaving only the browser icon bar. If you then use a keyboard short cut (<ctrl> <shft> <h>) to go to the Home Screen, and then select another app., you may find that part of the screen is missing, thus making the app unusable. Since this is a "Non-Dumb" review, some extra insight into exactly what Pepper has created is warranted here. The Pepper Keeper is written in Java. Some of the Pepper Keeper applications are really the standard Open Source apps executed inside Java wrappers. FireFox for the browser, and Mplayer for the Media Player are the 2 big examples. In each case the user interface of these is totally different than the stand alone app, and some features have been removed. Pepper has also licensed the proprietary stuff, and similarly wrapped it. The "Documents" app is a wrapper for the commercial Adobe Acrobat Reader. Others like "Mail", are custom. Also included are some commercial FireFox plugins like Flash 8, Real Player, Java, and Adobe Acrobat. Because of this, Pepper plays well with most web pages out of the box. The other big deal about this is that the different apps get a common interface and data interchange ability. For example, if you open the Book Reader, and tap on Book Store, a browser session opens right there, and takes you to MobiPocket. The same happens in other apps. It is somewhat similar to the way you shop for music in iTunes. It's actually quite advanced, and with a bit of getting used to, very user friendly. As long as hardware partners that solder chips in wrong-way-'round don't kill off the company, Pepper has some very marketable ideas here. Another advantage of wrapping everything in Java wrappers is --well -- Java. Even though everything runs as root, the security of the Java environment keeps apps from doing anything "bad". Even if the browser were compromised, theoretically no system files could be modified because Java would not allow it. Performance is also good. A quad 3.2GHz core duo, it is not, but that said, web browsing performance is defiantly on a par with the desktop experience. This is the first hand held device that passes my informal "eBay Test". Simply try to surf around eBay for a while. Do a few searches, re-sort the results, browse a few of the resulting auctions, repeat. This seems to bring every Nokia device I have had to its knees. The Pepper Pad does it flawlessly while streaming an Internet radio station at the same time. I am not saying that I have never had a long pause or even a browser crash, but it is night and day compared to say, my Nokia 770. The story is similar for the other apps that have been assimilated into the Keeper. Performance is good, but every once in a while, a dialog box or on screen display pops up that reviles it as the Linux app your are familiar with. Some apps ("Mail" comes to mind) are a bit primitive, and lack features you may expect, but in general the Keeper apps are very usable. A cool feature of the "Journal" program is that it exports to HTML. This allows you to create formatted text that will be readable by anything. It's actually very minimal HTML editor. So with no card slot, or optical drive, how do we get stuff in and out of this Puppy (Pad)? Pepper assumes you'll do this 3 ways. First, of course, we can download it from either the web, or an email attachment. Files the 'Pad knows how to handle are opened in the browser or with the appropriate Keeper app. In the case of some file formats, the Keeper offers to link you to an appropriate web based app, such as Google Apps. Since the Documents app does not handle the popular Microsoft Office files, any of these files will illicit this response. There is always an option to save the files to the Documents or Downloads folders. The second method is via a USB flash drive or external card reader. Note that this would include some mobile phones, cameras, and media players, but not all. The last method is by sync'ing with the Pepper Desktop application. This app runs on your "Normal" PC, and allows you to organize and share your files with your Pepper Pad. The PC app is Windows only, although I have read reports of users getting it to work on Linux via the usual methods of running Windows apps on Linux. I have not tried this. There is one more method, but as of Pepper 3.2 it works only in the Photo app. Universal Plug and Play (UPnP) is a file sharing/streaming method for home media devices on your LAN. Tapping Import in the Photo app immediately listed my MythTV system as a UPnP server. At the time I tried this, I happened not to have any pictures in my Myth Gallery. I'll update this once I try it again. UPnP support is missing from the other apps. More importantly for most users, Windows file sharing (SMB) is not supported. I am sure many a Pepper Pad has gone straight back to the retailer when people get it home and find that it cannot access anything on their Networked Storage, or other Windows based Media Server. There is no technical reason Pepper cannot support this. Similarly lacking is an FTP or SFTP client. There are solutions for all these, but only if you take the Red Pill. Back on the main Pepper screen, the Settings tab brings up a number of icons for "Control Panel" type stuff. Included are icons for Wired and Wireless Ethernet, Bluetooth, setting the time, calibrating the touch screen, etc. I hate to sound repetitive, but again Pepper got things right that Nokia dropped the ball on. Case in point: setting the clock over the 'net. My P-Pad set the clock immediately the first time I connected to my home network. On my Nokia 770, I had to install an xterm, then do a hack to get root access, then manually install npt, and then run ntpdate from the command line. What a difference! Some users have reported difficulties connecting to some wireless access points. At home, once I set up my router to accept the P-Pad's wireless MAC address, and put my WEP key in the Pepper Pad, it connected in seconds. It also connects immediately at a local restaurant that offers free WiFi. At work however, it does give me some problems. At my desk, it often reports "Unable to get IP address." It usually eventually connects, but can take several minutes of trying. In another part of the building it seems to connect fine. To be fair, my Nokia 770 often reports "Connected to <SSID> with local link IP address" (basically the same error), in the same locations that give the Pepper Pad problems. It seems certain routers give both devices troubles. To use a wired Ethernet connection one needs a USB to Ethernet adapter. Hunting around in my storage unit, I found a 3Com 10/100 USB Ethernet adapter that I bought quite a few years ago. This device was not on the list of supported Ethernet adapters, but it worked the very first time. A big complaint is that Bluetooth is only supported for Bluetooth mice and keyboards. No "tethering" (Dial Up Networking, or DUN) to your cell phone, no "beaming" objects (OBEX), and no using headsets. If you take the "Red Pill" (see below), some of theses can be fixed, and with more work, they can all be fixed, but for the "Blue Pill" users, there is currently no solution. If you are up to leaving the controlled environment of the Keeper, there is a whole other, and in my perception of things, quite separate world hiding inside your Pepper Pad. To take the Red Pill, just press <ctrl> <shift> <1>. A plain xterm pops up in a window over the Pepper Keeper. From here we can explore the Linux filesystem. Doing so, we find most of a Fedora Core 4 OS, less any Desktop Environment. No KDE vs. Gnome arguments over this device, they are both absent. Since the Pepper Keeper is its own UI, even the Window Manager's panel is missing. In other words, all you have is that xterm. Apps must be launched from the command line. <ctrl> <shift> <tab> switches between open windows, the entire Pepper environment being 1 window. You can, with a few exceptions, cut and paste between the Pepper apps and Linux apps, but there is no way to do the X-Windows style center click paste. Yum is present, in fact Pepper relies on it, so especially once you add back in a few of the common repositories, "yum install <app name>" works for many (but not all) apps in the repositories. This is a huge feature, as there are thousands of apps available this way. Just type "yum install openoffice.org-writer", answer yes to the dependencies, and with in minutes, you have the full, real openoffice.org word processor. I chose to add the OOo components individually in this manner to minimize the used space. I have also installed other FC 4, and even some FC 5 RPMs manually. OK, So the Pepper Keeper is a fairly comprehensive set of pre-installed apps, we have thousands of Flash, AJAX (Web 3.0) and web-based apps available from the start, and hundreds or possibly thousands of x86 RPM- based apps if we take the Red Pill. Still obsessed with adding more applications? No problem. Since the Keeper is based on Java, there has to be a full Java runtime environment in there. I have several, full, desktop-style Java apps that run fine. Just download the .jar, and type /usr/java/jre<version number>/bin/java -jar <your app name>. Of course, the command line utils are there too. Having ping, traceroute, etc., available on a hand-held device is great for admins, network engineers, etc. Another advantage of access to the command line is the ability to do a few quick "hacks". gconf-editor can be used to do some GUI "tweaks", and other tricks, such as blocking ad sites using the hosts file, are easily done. Even changing the background (Wallpaper) is not supported from the Keeper, but is easily done from the command line. Not having a desktop or any GUI way to launch apps is somewhat inconvenient, but many users have reported success in either enabling the included icewm panel, or installing another one such as the Gnome-Panel. I don't mind the command line, and since bash has lots of features to make recalling previous commands easy, I just use that for now. I am investigating the possibility of writing a simple, user-configurable launcher based on Apple's old Control Strip concept. If I ever get anything running, I think you know were you'll be able to find it. With the Red Pill, and a little knowledge of Linux, some of the features that are missing in the Keeper can be, at least somewhat, replaced. Bluetooth Object exchange is not supported, but if you install the OBEX rpms, obex_push will allow some level of Bluetooth file exchange. Unfortunately, it is not as easy for Bluetooth Dial Up Networking (DUN). Bluetooth serial support was left out of the kernel by Pepper, so it cannot be easily made to work even by manually editing the files. Building a new kernel is an option, but only to those brave, and patient enough to do so. The Red Pill comes with some warnings. As mentioned, the Pepper Keeper runs as root, so the shell you get when you <ctrl> <shift> <1>, is a root shell. The potential for doing damage with a miss-typing does not need to be explained to experienced Linux users, but those with less experience be warned. Pepper does not supply or support any way to do a full re-install, or recover a messed-up filesystem. Statistics will eventually catch up with even the most experienced Linux user, so the potential for turning your Pepper Pad into a useless paper weight approaches 100%. The security implications of running everything as root should also be emphasized. For completeness, I should also mention that there is a "Debug" mode that adds some functionality to the Keeper. Press <ctrl> <shft> <0>. A pair of menus (yes, menus, not tabs) appears above the top row of tabs in the Keeper. These debug menus contain an number of -- Well -- debug functions. They include updating software, and viewing logs. They also contain some functions that may be more widely usable, such as viewing the HTML source of a web page. More importantly, this alters the way the "Import" tab works in most Keeper applications. It adds the internal HD as a source of files. This is important if you have brought files into the system from SCP, FTP, or some other method. It only allows you to browse under the /opt/ directory. It is in this directory that all the Keeper apps store their data. A lot of the Pepper software is located here too. Pepper stores files in directories under /opt/. For example, /opt/Documents, /opt/Images, etc. Using this debug feature makes it fairly painless to move stuff between Linux apps and the Keeper functions. I like my Pepper Pad alot, and I have rarely set it down since I got it. Even forgetting the underlying Linux functionality, it has apps to do 90% of the functionality that most people need. If you are willing to take the Red Pill, it is very, very close to a full laptop replacement. Yes, it has hardware quality issues, as well as software and connectivity omissions and bugs, but generally functions well. It has the lowest frustration level of any similar device I have used. It may cost a little more than a Nokia Internet Table, but given that the Nokia Tablets are, in my opinion, non-functional for many common websites, I would much rather spend $699 for functionality, than $399 for non-functionality. Whether you buy a Pepper Pad, is of course up to you, but if you try a try a few common sites like eBay, YouTube, or other media rich sites on both the Pepper Pad, and the Nokia Tablets, I can almost guarantee that you won't buy the Nokia Tablet. I intend to compile a list of Linux and Java Apps that I am using on my Pepper Pad. (Red Pill required, of course.) Check back soon.